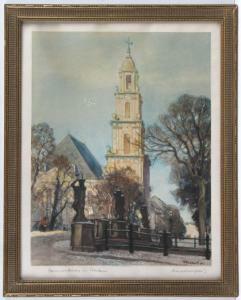 Find artworks, auction results, sale prices and pictures of Bruno Bielefeld at auctions worldwide. 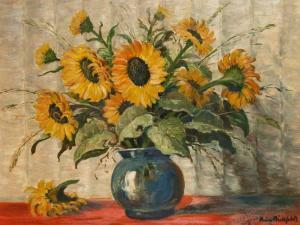 Signed lower right "Bruno Bielefeld"
This oil painting shows a fresh bouquet with sun flowers and field grass in a blue, spherical vase. This stands on a red table cloth in front of a light background. It seems that a small butterfly hides in the bunch; only an orange-white wingtip is visible. The painting is by the German artist Bruno Bielefeld (1879-1973). Bruno Bielefeld studied art in Berlin and Gdansk. One of his professors was Adolf Maennchen. 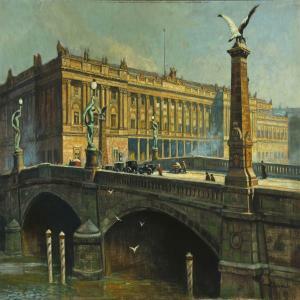 Bielefeld made several study trips to France, Italy, Scotland, North America and England, where he founded in Liverpool the "Empire Art Company". When Bielefeld returned to Germany in 1912, he settled in Berlin and focused his artistic works on Old Berlin. A large part of his work was destroyed in World War II. 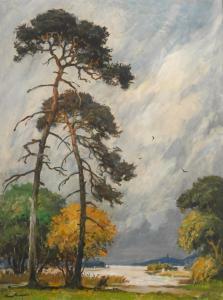 Paintings by Bielefeld can be found in Museums in Berlin and Munich. "Börze zu Berlin mit Friedrichsbrücke". Several larger repairs / patches on the reverse.